This is part 2a of the translation of my treatise Jesuspassagerna hos Josefus – en fallstudie into English. In the extant copies of Flavius Josephus’ Antiquities of the Jews, there are two references to Jesus Christ. The first and longer reference is found in book 18. It generally goes by the name of Testimonium Flavianum (hereafter the Testimonium or just TF), i.e. (Josephus) Flavius’ testimony (of Jesus Christ). There can be no doubt that in the wording that the text passage of Jesus exists, at least a part of it is composed by a Christian hand. The Testimonium Flavianum has namely a distinct Christian character. After more than a millennium as a positive Jewish testimony of Jesus, this paragraph’s authenticity has in modern times come to very much be called into question. The issue which needs to be raised is whether only parts of the paragraph are later additions, or if the entire paragraph is an addition to the text Josephus wrote. The pendulum has swung back and forth and at present most researchers seem to advocate that there is a kernel written by Josephus. The second reference to Jesus appears in book 20, which is the last book, in the form of a subordinate clause concerning the execution of the “brother of Jesus called Christ, whose name was James.” Most scholars believe that Josephus has written this. We shall return to this later on in “III. The brother of Jesus, who was called Christ, whose name was James”. For the sake of clarity, I have put the parts in bold which show a distinct Christian character. 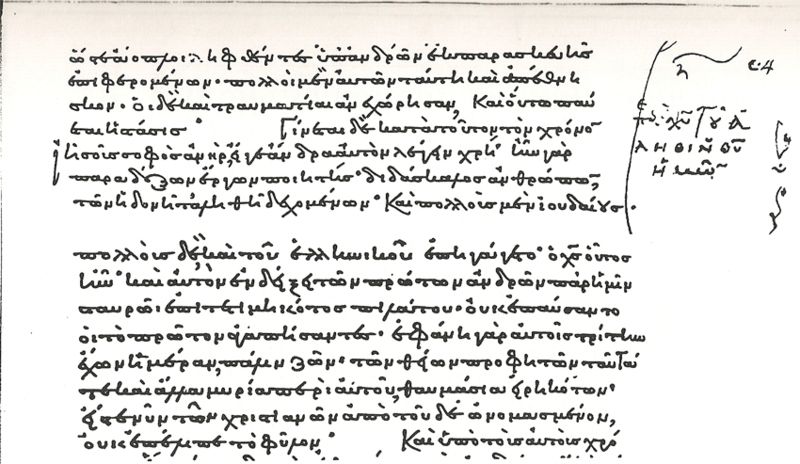 These parts contain such praises to Jesus and Christians as reasonably only a Christian would write, and as we do not have any actual reasons to believe that Josephus was a Christian, they are usually eliminated in the many reconstructions of the Testimonium Flavianum that flourish.The text says that Pilate sentenced him to the stake. The Greek noun stauros (σταυρός), as well as the verbs derived from the word does not primarily mean cross. The collected ancient literature never reveals how the suspension devices were designed. The translation into cross and crucifixion is therefore coloured by the Christian world of imagination and our beliefs that the Romans also used cross beams on their suspension devices when punishing people. Where accordingly the words cross and crucifixion occur in this thesis, there is nothing linguistically to support that translation. The oldest surviving manuscript of the Antiquities of the Jews by Josephus is from the 9th or the 10th century, but it does not contain the books 18 and 20 where Jesus is mentioned. The oldest surviving manuscript containing the Jesus passages, Codex Ambrosianus (Mediolanensis) F. 128 superior, is from the 11th century. The part of this manuscript which contains the Testimonium Flavianum is depicted below. TF begins at line 4 with Γίνεται (arises) and ends on the last line with φῦλον (tribe). However, the Testimonium Flavianum is attested to far earlier than the 11th century and by many people, so the focus must be on all those witnesses. The first person to even mention the TF is the Church Father Eusebius of Caesarea in the early 4th century. He is also the first person to refer to the second Jesus-passage from book 20, about the execution of “the brother of Jesus, who was called Christ, whose name was James”, although it frequently and erroneously is said that Origen was the first to make such a reference. Origen, however, relates to another and now lost passage of Josephus, in which also the phrase “the brother of Jesus, who was called Christ” occurs. After Eusebius has reproduced the TF, the paragraph is cited in Greek by several church fathers (albeit that it would take at least a century) with basically the same wording. No deviations of importance exist. However, TF is also translated into other languages, including Latin and Syrian, and there some divergences from the normative text in all the manuscripts of Josephus’ Antiquities of the Jews and Eusebius’ Church History (or Historia Ecclesiastica) are found. These different versions will be examined later on in this thesis. In his doctoral thesis, Gunnar Samuelsson “investigates the philological aspects of how ancient Greek, Latin, Hebrew and Aramaic texts, including the New Testament, depict the practice of punishment by crucifixion.” (Gunnar Samuelsson, Crucifixion in Antiquity: An Inquiry into the Background of the New Testament Terminology of Crucifixion, Göteborg 2010.) Samuelson notes that in Hebrew there is no word for the tools that were utilized to suspend people, and therefore a Hebrew word meaning wood was used. In Greek and Latin words with a similar meaning were used, then xylon (ξύλον) and dendron (δένδρον); and lignum and arbor respectively (p. 51). Accordingly one is suspended on wood. The Latin crux means cross, but still could refer to “some kind of vertical object of wood” without a cross beam “– a pole, an erected beam or the trunk of a tree” (p. 28). “The Greek counterparts” to the Latin word crux are stauros (σταυρός) and skolops (σκόλοψ) (p. 27). A stauros means a standing pole and is the word that is used in the TF. In the New Testament the words stauros (pole) and xylon (wood) are used first and foremost. There is no way to determine if the pole was fitted with a cross beam. According to Diodorus Siculus a “σταυρός could be used in an executionary suspension in which nails were used in Hellenistic times” (p. 127) There is no unambiguous report of crucifixion in the preserved materials of Josephus, apart from the fact that also he “implies that nails could be used in the suspension act”. The “only secure conclusion that can be drawn from Josephus’ texts is that the suspension methods might appear rather diverse in different situations” (p. 155–156). It should also be notes that there is nothing to preclude the cross shape. It just was not a particularly interesting factor in the descriptions. Except the Romans were very conservative, very religious and very superstitious. They had two different kinds of crosses that we’d recognise as crosses: a votive cross called a tropaeum, a military yoke called a furca We’d recognise them because to the Romans, the cross represented Victory because universally, it symbolised the rays of the Sun. Then they had an execution utility pole called a crux. Although it wasn’t exactly cross-shaped, it had a crossarm. It also had something else! An impaler. Explains why Greek-speakers used skolops (σκόλοψ) even in Roman times. And it also explains why the Romans differentiated it from the tropaeum and the furca. The second link shows the Vivat Crux Graffito behind the Puzzuoli Graffito. Both are extremely rude. But that pole was not the only kind of crux! Other cruxes included impaling stakes that pierced the rear end and some kind of wooden item that suspended one with his head upside-down. (Seneca, De Cons. 20:3) But the word crux was also used to use to describe the tow-pole of a wagon, carriage or chariot (etc) which could impale somebody if he’s not careful; and the membrum virile of Priapus. So as I see it, the Romans considered crucifixion as some kind of impalement. Now does this mean Jesus was impaled on as well as nailed to the execution utility pole? Bear in mind that with the impaler, people up on the pole would have survived for a few days. Without it, they’d exhaust themselves and die within hours. The Pozzuoli graffiti was very interesting. Do you have any further information concerning the dating of the inscription? From what I could decipher from the Italian text, Zaninotto suggest a dating to the first century. Sorry, I do not have any further information concerning the dating of the Puzzuoli graffito except I’ve read somewhere the date of 100CE posted. I think Zaninotto is correct. Here’s an article in Italian that provides a bit more information on the graffito.